Well, it has been done for kind of a while. Like, since the first of July. Slow blogger over here! I ended up taking Steve’s suggestion and I hung some art that we already owned: black and white photos that I took when I was studying in Barcelona. You can see one here, over the towel bar. The others are behind the door. The mirror looks a.w.e.s.o.m.e and was worth the annoyance of having it arrive broken. My cheap-o fix is undetectable to the untrained eye. The size is perfect, and it is delicate enough to look custom and special. As you can see, I kept the window frosting after all. If you remember, it did not look that nice when I put it in. Here’s a tip: if you install the film-style window frosting (I used Gila, available at Home Depot for like $25), do not try to do it alone. Do not apply it at night. Do not decide half-way through that you hate it, crack open a beer, and then decide you should finish it. But most importantly, don’t tear it down after all that. Because it does settle down a bit, the bubbles dry out, and the edges relax. And it doesn’t look awful after all. The sink was a beast to install. When our plumber came to fix the in-wall rough in connections for us, he gave us some good advice for installing a pedestal sink: RUN AWAY! Ok, no, he didn’t say that. But he said to do our homework, be careful, and schedule plenty of time–10 hours!–to get it up and running. He was right (well, he IS the plumber in all this). So Steve did just that: he studied up, and planned a whole day. And he did an awesome job. I love love love it–it’s the perfect size, the faucet is classic and modern all at the same time (now I’m just makin’ shiz up). 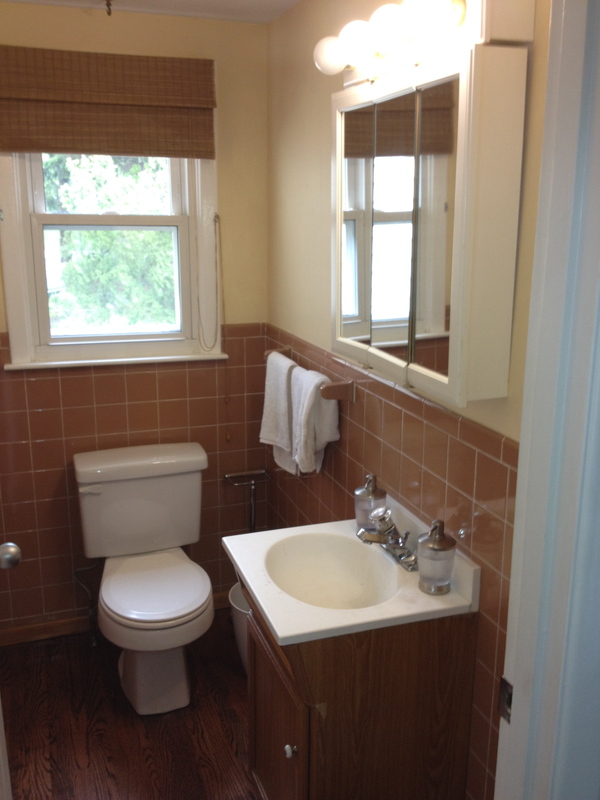 The sink is from Lowe’s and for the two pieces–the base and the bowl–it was like $60ish. 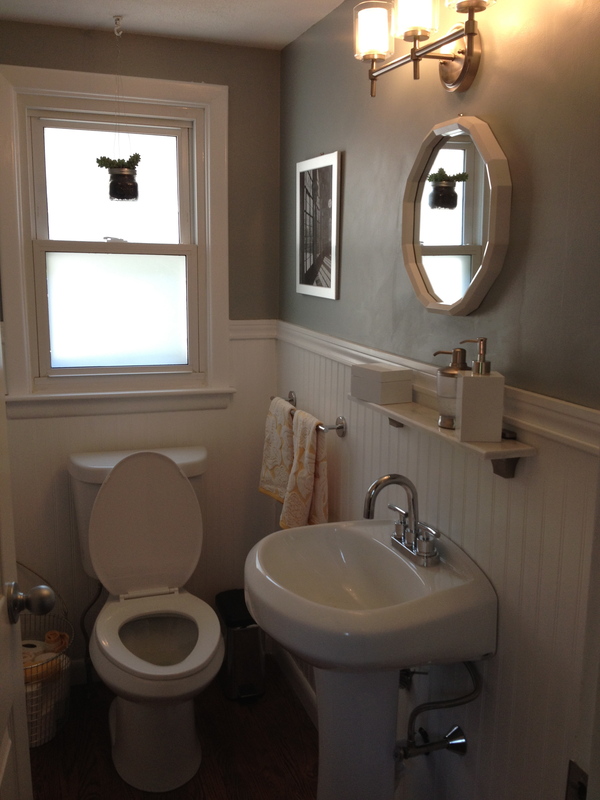 The “everywhere gray” paint looks great with the crisp white bead board and moulding. I wanted to pop the neutrals with some yellow, so in came the towels. They are from Target (story of my life, yo) and I’m pretty sure that my parents received something similar for a wedding present in 1971. The Smith and Hawken (…Target) wire basket is filled with toilet paper and extra towels, and solves the “where do I put that? !” problem. The marble shelf we replicated from Pinterest is awesome–perfect size, goes nicely with the marble tile in the hole, and suits the new square white accessories wonderfully. Those were from Home Goods and totaled something like $15. Last but not least, I needed a plant in there. 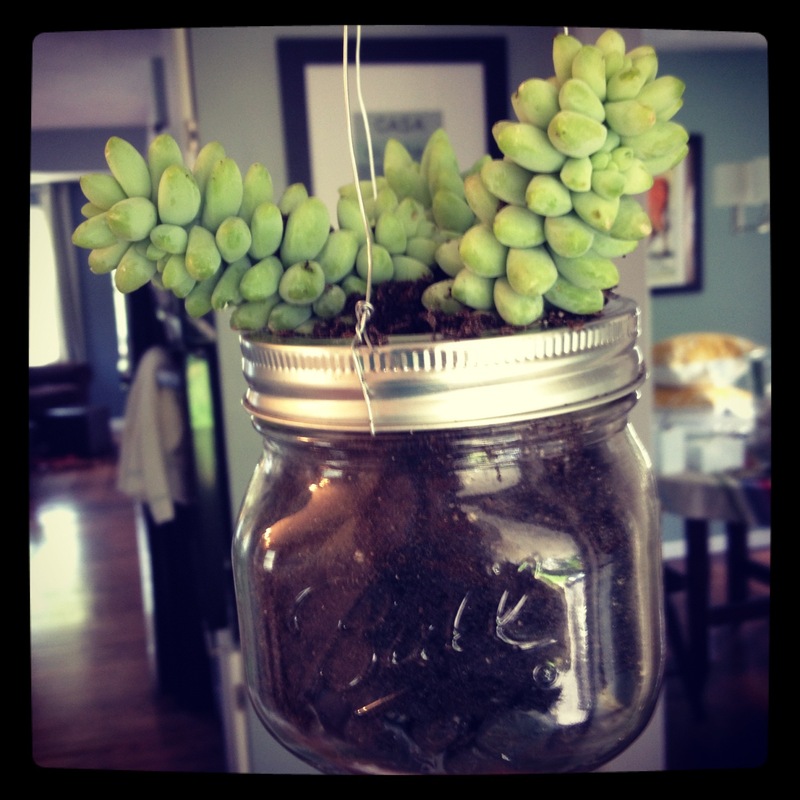 So in came my Pinterest-inspired mason jar planter with a burro’s tail. It hangs over the toilet from a pre-existing ceiling hook. It’s darling, darling. Uhh, my math skills are bad, but the accessories *did* cost about $134. Add up the tags in this pic, and it’s more. That’s because I counted the window frosting as an accessory in this pic, but not in the total; it is covered in the big figure above. Our original budget was “safely under $600.” Ok, so that didn’t happen. But we were not planning on the MASSIVE plumber bill. 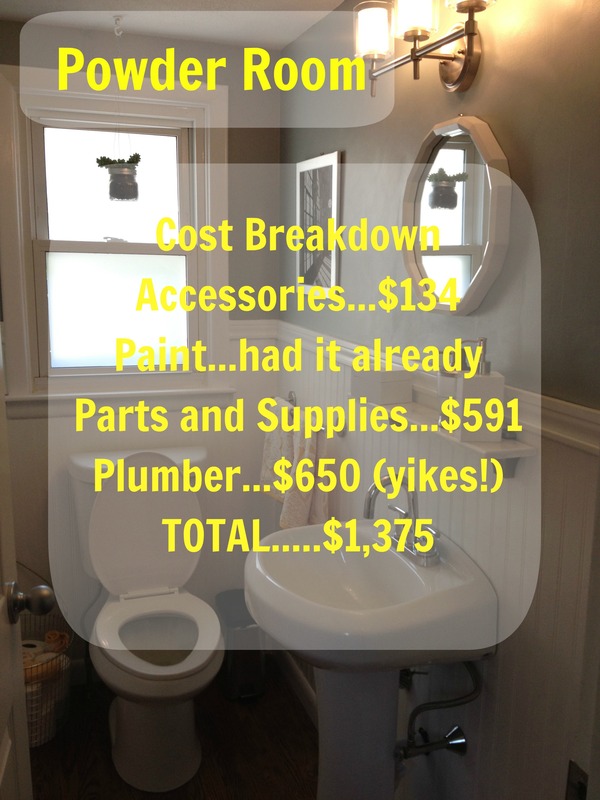 Had the original plumbing not been the DIY equivalent of a fiery train derailment, we would have been pretty close to the budget. I chalk this up as a win, frankly. I’ve read that any renovation shouldn’t cost more than the cost per square footage of that room, to prevent over-improvement. The cost per square foot of this house is roughly $101. 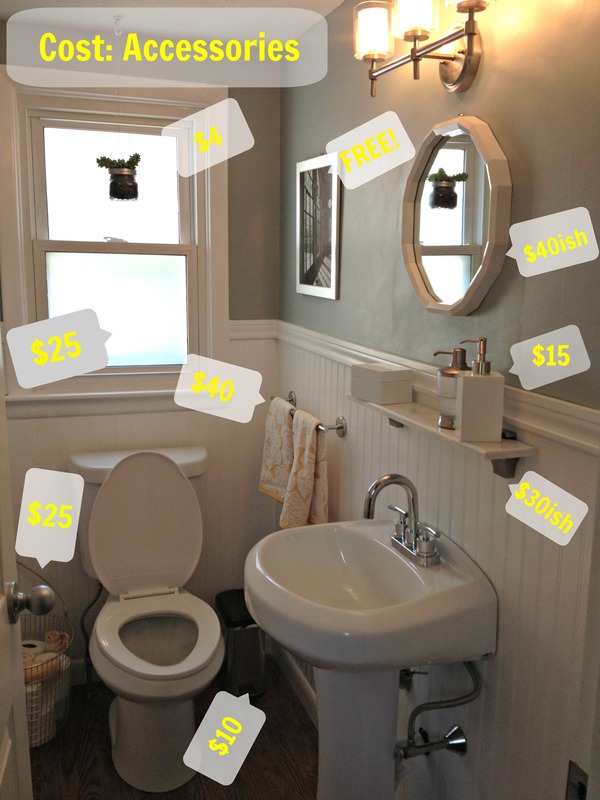 The room is about 4.5 feet x 6 feet, so 27 square feet….so it should have come in at or under $2,700. We are half that, so go us. Go us. You guys rock! Beautiful renovation! Can you come work on our house. Thanks.